This new public library by Canadian firm RDHA features a large slab that cantilevers over the landscape, a sloping green roof and an exterior stair that runs up the front of the building. 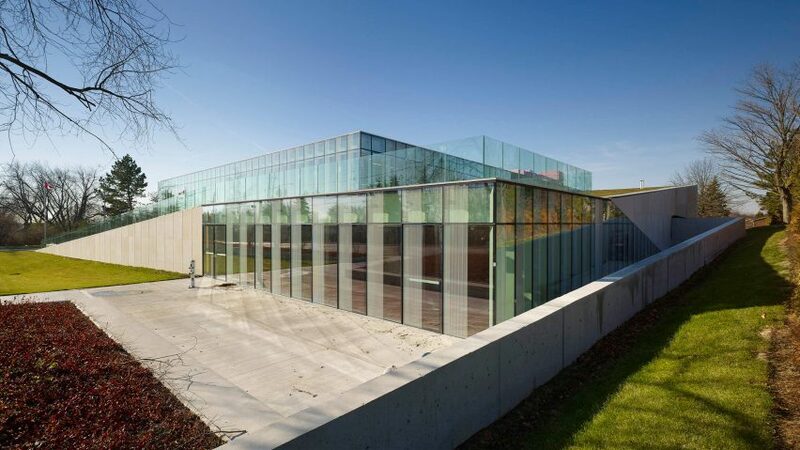 The Waterdown Library and Civic Centre is located in the city of Hamilton, about an hour's drive from downtown Toronto. 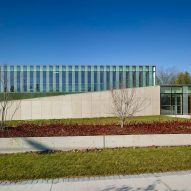 Encompassing 23,500 square feet (2,183 square metres), the building is nestled into a grassy escarpment near Lake Ontario. While it appears low-slung from the exterior, the building contains six levels – several of which are carved into the hillside. 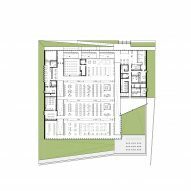 The multi-use facility houses a library, a community service office, a heritage society archive, and a recreation centre for senior citizens. RDHA – a Toronto firm established in 1919 – was given a budget of $6.8 million Canadian (£4 million) for the project. "RDHA applied the studio's practice of customising off-the-shelf components to create an extraordinary building from ordinary materials," the team said. "Even the most standard elements such as strip lights were treated with a degree of care that adds elegance." 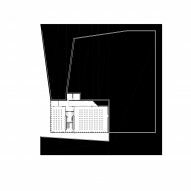 The building is clad in expanses of glass and limestone panels and fins. The facades vary from nearly opaque to fully glazed. Ceramic frit on the glass helps mitigate solar heat gain. 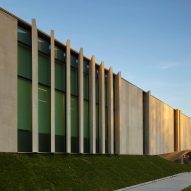 The building's upper slab cantilevers over the sloped site "like a hovering block of dolomitic limestone". An exterior stair gently ascends the site and arrives at an outdoor terrace bordered by glass walls. Running alongside the stair is a sloping green roof with flowering sedums. 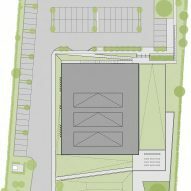 Inside, a series of winding, sloped walkways connect various levels and resolve the site's height differences. 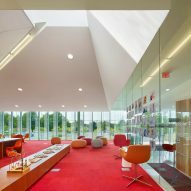 Sawtooth skylights and bands of floor-to-ceiling glazing bring ample daylight into the facility. 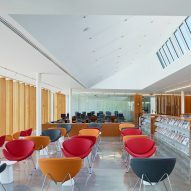 Within the building's central open space, which houses the library, RHDA created four "terraces" – one for the children's section, and the other three for the teen department, adult collection and a reading atrium. "The internal topography heightens awareness of the surrounding landscape," the firm said. "It reaches its peak in the library, where a series of four terraces step up towards the highest point in the building, demarcated by a path of Douglas fir book stacks." Interior finishes include wood, concrete and glass, with raspberry and orange chairs adding pops of colour. In the entry corridor, Douglas fir accents are made from salvaged wood from a demolished library. Sustainability was a concern for the design team. 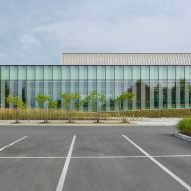 The building features non-toxic materials, bioswales – which remove silt and pollution from surface runoff water – in the parking lots, and an underground rainwater collection system. The new facility has seen a 150 per cent increase in visitor numbers compared to the older library it replaced. "Library customers love that they have such a beautiful place community workspace to call home," the firm said. 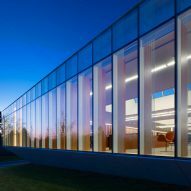 Other libraries in Canada include a facility near Vancouver by Bing Thom Architects that features angled concrete walls and curved windows, and a Halifax library by Schmidt Hammer Lassen that is composed of four stacked blocks of varying dimensions.